You may have read about Washington State (where I live) passing a law giving people the right to purchase recreational marijuana. That’s right. No exclamation point, just hooray. When I was a much younger man, over 40 years ago, I wore a NORML T-shirt. 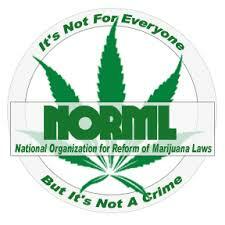 NORML stands for National Organization for the Reform of Marijuana Laws. I wore it proudly and received many compliments from other “heads” and the equally pot enamored (or addled). The point was obvious to me, even then, that marijuana should be legal, for many reasons. It was easy to reason that alcohol did far more damage, ruined countless more lives, and killed thousands from drunken driving alone. Yet it was more socially acceptable than a drug that pretty much turned everyone who used it into the human equivalent of really forgetful, ravenously hungry pussycats. I fell under the sway of its siren song early, and could rightly have been called a drug abuser. There was nothing casual about the amount of pot I used or its effect on me. It got so bad that I had dealers try to talk me out of buying pot, saying things like, “Not everyone should smoke pot. It’s just not the right drug for some people.” I was definitely one of those. I slowed down significantly in my mid-20s and totally stopped by the time I was 30. In the end it wasn’t my short-term memory loss (which plagues me to this day), or even that it was morally ambiguous to purchase it. It was the fact it was hard to get. You had to know a person, who knew a person, who ultimately had to deal with some unsavory person, who probably had to deal with some seriously scary people. In the end, it was the inability to easily purchase it, and the embarrassment of the childish search for that “person” that led me to stop. Nothing I did by using it bothered me in the least, but people died getting it into my hands. You could claim lack of complicity, but without your money, there would be no market. No market, no sales, no money, no turf fights, no cartels. Also, no unfair jail time for people who should have had the right to legally dispense a drug that was probably far less harmful than alcohol, all things being said. It was my dream as a young man to be able to legally purchase it, just like in Amsterdam. Many years of patient lobbying have started the dominoes falling, and sooner or later I believe most states will fall in line. Mostly for the tax money, but still… It doesn’t surprise me that Washington State would take the lead. They are ahead of the game on lots of issues – minimum wage, gay marriage and now marijuana. So, I set out to buy some, yesterday and today. Not so much to smoke, but just to have closed the circle on that dream. It’s legal, it’s for sale. And it’s unavailable. Stores that claim to be open at a certain time (I’m talking about you, New Vansterdam) aren’t open at all, closed due to a run on their very small supply. There is only one approved grower in our area, and the small amount these stores get goes fast. First stop I made, I met with a padlocked door, and a sign that offered a “Grand Re-Opening Friday July 18th”, which just happened to be that day, the day I was standing at their door. On that day, they wrote on Facebook they had gotten their grand re-opening supply and sold it in an hour. They said they would open the next day, when they got their next supply, but they couldn’t guarantee that it would be their regular time, and to keep in touch via Twitter. Sounds a lot like something a drug dealer would say. I went to the pot store the next day at 11 a.m. There was already a line a couple of blocks long. They had some for sale, had gotten it sometime during the night, but they were still busy breaking it down and wouldn’t be opening for another hour. So I left. At this point nothing has changed for me. Just as when I stopped smoking pot in the ’80s, it was once again the inability to easily purchase it, and the embarrassment of the childish search for a legal salesman (with a true understanding of supply and demand) that thwarted the siren’s song. Much like Ulysses (who I’m often mistaken for), I jammed some wax in my ears so the I couldn’t hear the siren’s singing, and took my money to Fred Meyer, where I bought some awesome cherries and some food for my cat, Abby. I’ll get my fix petting her. She’s an actual pussycat and doesn’t need any “catnip” to get in that frame of mind. 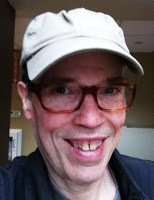 John Knapp is a thwarted herbologist who lives and works in Vansterdam, Washington. Hooray. Editor’s note: I met John through The Oregonian’s Community Writers program, which allowed readers to nominate themselves to write regularly for the Opinion section. He’s witty, curious, intelligent and fully engaged on this blog and Facebook. Which I appreciate. This entry was tagged john knapp, marijuana, new vansterdam, NORML, voa 4.0. Bookmark the permalink. The hunt stopped me too. I was exchanging money under a table at a dive bar in a bad neighborhood and had a ‘What am I doing?’ moment. The lack of business acumen on the part of dealers always surprised me, and I’m a little surprised now that the stores don’t have it more together. Though I’ve never partaken, legalizing weed always made sense to me from an economic standpoint. Since Washington legalized I’ve seen issues and questions come up that I had never considered (where would the supply come from? how should drug testing change? etc). I’m finding the topic fascinating as I watch it unfold across the river figuring Oregon isn’t too far behind. Thank you for sharing your insight! Like you, John, I was a pothead from way long ago and through the years, I smoked my share. I quit in the mid-80s when I developed anxiety issues associated with it. I voted against legal pot in Oregon the last time it came to a vote. Having said all that, though, I wandered across the river a few days ago to check out Main Street Marijuana. It was on a corner in Vancouver, a regular-looking building with frosted glass halfway up. Once inside, after not needing to show proof of age (darn! ), I saw mostly older folks looking at the product along the walls, with a selection of pipes in the interior cases. Taken away by the idea of actually buying legal pot, I talked to the (grumpy) sales guy and learned about different varieties (when I explained I had quit because of pot-induced anxiety, he grumpily suggested that perhaps pot was not a good idea). Regardless, I left with a gram of overpriced pot and spent the rest of the weekend amazed at the reality of buying legal pot. I’ve been on the fence about our upcoming initiative in Oregon but your excellent points about the morality of funding drug lords make a lot of sense. In the long run it makes more sense to keep the money collected in taxes in Oregon and not in some bad guy’s pockets. Love this insight. What a great day to be back in town from vacation/etc. and able to enjoy VOA. (Those who have come before, I am excited to play catch up.) John, I have been to Main Street Marijuana a few times now for work and neighborhood purposes. (Even though I favor New Vansterdam’s name, Main Street M is close to me.) Every time I am there or near there, the line is significant or the store is sold out of weed. They are happy to show me a lot of cheap, attractive glassware! Interesting riddle they are working on solving. I do think legalization the lesser of two evils, but I keep in mind stories like this from a self-described former pothead who tells the tale of how the drug made people the “human equivalent of really forgetful, ravenously hungry pussycats.” Thanks for sharing this! Thanks everyone for your nice comments. Lynn, your story is torn right out of the pages of my book. I’m jazzed about it being legal, but am pretty sure it’s not for me. Liz, your story in the Oregonian was great. BTW, New Vansterdam now seems to have a more steady supply. Very much enjoyed your piece, John! My favorite line: “but just to have closed the circle on that dream”. Every year as a high school administrator, I have students in my office who argue the merits of marijuana usage, both to me and to their parents, based on information they’ve found on the internet. I would like to use your piece as an intelligent counter. Your piece is balanced, nuanced, honest, and humorous. That’s a winning combination that I hope will resonate with our youth. Aki, thanks very much. I actually don’t recommend most people use marijuana, but believe we should have the right. Of all the drugs I loved before, pot was never one. I can’t even tolerate the smell from a bad experience in my formative years. But I’m happy that it’s finally being legalized and I’m hopeful that it will make a difference for our society in a myriad of ways over time. I can definitely see the rationale for legalizing it, but I worry about the consequences especially with college students. But then I am a worrier, so you probably shouldn’t listen to me. I grew up in a culture where for people of my generation, coffee was the drug of choice. Thank goodness, because now they say coffee and tea are really good for your health. Yet here I heard about the Amethyst initiative by liberal arts colleges to change the 21 year drinking age. I know from experience colleges tacitly condoned under-age drinking and actively supported students when they had run-ins with law enforcement. Of course, it’s good to advocate on behalf students, but I definitely saw the negative impact of such early alcohol use and a culture that supports it. The brain continues to develop in young adults and alcohol can cause irreversible damage. As a parent of a child who went through chemotherapy, I have a great respect for the liver. Even if you don’t consider recreational drugs, it has to process so many naturally occurring toxins in our diet on a regular basis, not to mention medications like Tylenol. Every time it is used to detoxify your body, it dies a little and has to regenerate itself. Now with legalized pot, I wonder what’s going to happen in Walla Walla. Perhaps we should have a lot more education about this, hopefully with vivid pictures and videos of the liver like I once saw at Vegfest. You are probably asking can I walk the talk? Not sure. Since June, I have been trying to go caffeine-free for a week, but each morning the delicious aroma a freshly brewed coffee makes my fall of the wagon – yet again.